Les avions occupent une place importante dans l’œuvre d’Hergé. Cette étude de 176 pages en couleur se propose d'en dresser l’inventaire et de replacer chaque avion dans son contexte historique. It was serialised weekly from July 1961 to September 1962 in Tintin magazine. Series - The Adventures of Tintin. Presentation - Hardback. We do not mark any orders as "gifts" or with lower prices than those invoiced / paid; these actions are prohibited under national and international law. Un guide du maquettiste, de 60 pages couleur, dédié aux avions représentés dans les aventures de Tintin par Hergé. 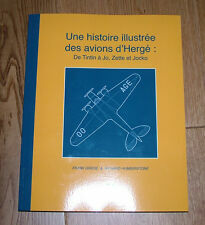 Tous les avions qui apparaissent dans les albums de bande dessinée classiques sont illustrés par un profil à l'échelle 1/72 et 1/144, avec des informations détaillées pour la peinture des maquettes. Tintin is the classic example of groundbreaking graphic narrative that all others can be compared to. A fully illustrated guide to the world-famous character Tintin, and his adventures.This well-researched and gorgeously presented overview follows Tintin through all 24 titles of the series. 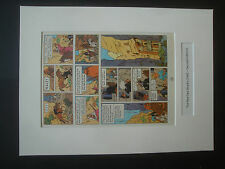 A mounted page plate from the 1965 Second Edition of "The Red Sea Sharks" by Herge. The plate is held in place by picture tape, so can be easily removed if required. 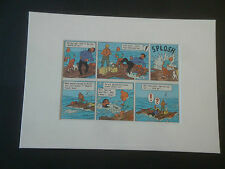 A selection of mounted page plates from the 1965 Second Edition of "Red Sea Sharks" by Herge. The page plates are held in by picture tape and if wanted, the page could be easily turned to display the other side. Editor - Moulinsart. Release date - 2012. We do not accept used, altered or modified products. After completing your order you will see a confirmation screen for your order with our bank details. We do not mark any orders as "gifts" or with lower prices than those invoiced / paid; these actions are prohibited under national and international law. The fac-similés albums are identical copies of the first editions of Tintin albums. In this edition you will find the 22 albums of Tintin's adventures that were published between 1945 and 1976. Series - Fac-similé couleurs. Editor - Moulinsart. 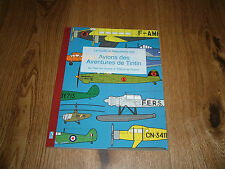 The archives Tintin Atlas: Tintin et l'Alph-art, (French-language). Series - The archives Tintin Atlas. Release date - 2012. We do not mark any orders as "gifts" or with lower prices than those invoiced / paid; these actions are prohibited under national and international law. New listingTintin. Flight 747 for Sydney. Flight 747 for Sydney. etat correct. New listingTintin. Cigars of the Pharaon. This book is in French. We do not mark any orders as "gifts" or with lower prices than those invoiced / paid; these actions are prohibited under national and international law. After completing your order you will see a confirmation screen for your order with our bank details. A rare limited edition Tintin Et Les Picaros (Tintin and the Picaros). This is known as the "cocktail edition" and was a special limited edition produced to promote the launch of the new Tintin album in 1976. Editor - Gallimard. Release date - 2015. Pierre Sterckx made extensive use of the Hergé Museum archives as he researched this work. The author presents the evolution of Hergé's work, from the simplicity of his first drawings to the pinnacle of his clear line style, from his first attempts at colour to the mastery of his final full-colour pages. No writing. Boards are generally very good, slightly bowed. Spine also very good. My prices are fixed and non-negotiable! Could not be better. Knowledgeable and friendly . A great item! Fantastic service. Discover all the talents and traits of one of the most famous characters of the Tintin's Adventures. This book will bring you into its intimacy with many unpublished or little-known drawings embellished with sources that inspired Hergé during its creation. Editor - Moulinsart. Release date - 2015. We do not accept used, altered or modified products. After completing your order you will see a confirmation screen for your order with our bank details. We do not mark any orders as "gifts" or with lower prices than those invoiced / paid; these actions are prohibited under national and international law. Hergé intended the story as a satirical criticism of the expansionist policies of Nazi Germany, in particular the annexation of Austria in March 1938 (the Anschluss). Le sceptre d'Ottokar Edition fac-similé Black & White. Series - The Adventures of Tintin. Presentation - Hardback. We do not mark any orders as "gifts" or with lower prices than those invoiced / paid; these actions are prohibited under national and international law. 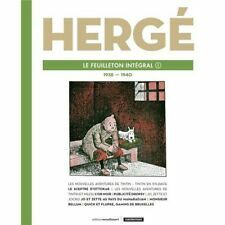 Tintin Le Feuilleton intégral Hergé 9 1940-1943. Series - Le Feuilleton intégral. We do not accept used, altered or modified products. After completing your order you will see a confirmation screen for your order with our bank details. I also have in English the "Tintin in Thailand ". We do not mark any orders as "gifts" or with lower prices than those invoiced / paid; these actions are prohibited under national and international law. After completing your order you will see a confirmation screen for your order with our bank details. Editor - Moulinsart. This richly-illustrated Artbook traces the story of the film. Language - French. We do not mark any orders as "gifts" or with lower prices than those invoiced / paid; these actions are prohibited under national and international law. NO OF SPECIES IN ONE ENVELOPE. Belgian Edition. Issue No. 23 of June 3, 1948. I decided to develop a professional activity in 2017 and so I created a separate account for this purpose. Type de publication Hebdomadaire. Average state. Series - Chronologie d'une oeuvre. We do not accept used, altered or modified products. After completing your order you will see a confirmation screen for your order with our bank details. Receiving your order safely and against your signature. Subsequently the adventures of Tintin appeared only because of a daily strip in the newspaper La Soir who appeared : the mysterious star, the secret of the Unicorn, the treasure of Rackham the red and a good part of the 7 crystal balls. Very good condition. Presence of timbre Tintin. Belgian Edition. I decided to develop a professional activity in 2017 and so I created a separate account for this purpose. Issue n ° 2 of January 9, 1952. Belgian Edition. Issue n ° 33 of August 17, 1950. Type de publication Hebdomadaire. Belgian Edition. Issue n ° 21 of May 26, 1949. I decided to develop a professional activity in 2017 and so I created a separate account for this purpose. Type de publication Hebdomadaire. Very good condition, pretty cool. The condition of it is like new. Mint. Out of print for a long time. Belgian Edition. Issue n ° 31 of August 4, 1949. Type de publication Hebdomadaire. Belgian Edition. Issue No. 46 November 17, 1949. I decided to develop a professional activity in 2017 and so I created a separate account for this purpose. Very good condition, very fresh. Point-no cut contest (see photo). Belgian Edition. Issue n ° 8 of February 24, 1949. I decided to develop a professional activity in 2017 and so I created a separate account for this purpose. Very good condition, pretty cool. A few micro-dechirures to the fold of the first sheet (see photo), no other tears, 2 traces of horizontal fold (see photos). Belgian Edition. Issue No. 30 of July 28, 1949. I decided to develop a professional activity in 2017 and so I created a separate account for this purpose. Very good condition, very fresh. Type de publication Hebdomadaire. Belgian Edition. Issue n ° 24 of June 10, 1948. I decided to develop a professional activity in 2017 and so I created a separate account for this purpose. Correct state. Type de publication Hebdomadaire.